Snowtopia - I bet you think this blog is about you. A perfect society in every way except there is no lettuce. The snow was pretty enjoyable, actually. The start was unpleasant only because we had the monthly shop to get done on Thursday, and the grocery stores were a wreck. Between Target and Shoppers I was able to find 1/3 of our produce and dairy needs and $50 of booze. But I did get all the meat and pantry staples, at least. The snow started in earnest on Friday afternoon and kept up consistently through Saturday noon. From there the storm supposedly was swirling in such a way that we got a reprieve of several hours before resuming, and it kept on until maybe 1 am Sunday. 25.0" total! I've never seen that much snow in one storm, so it was pretty enjoyable to watch from inside. Our offices were closed Monday and today, and it's still not clear what will happen tomorrow but I anticipate we'll be open. On Sunday I went with Brian, Kevin, Patrick, and Sara to happy hour at American Ice, where their kitchen was about as well supplied as Shoppers. Their food menu consisted of brisket nachos, veggie nachos, and chips with queso. :) We had four plates of nachos with drinks, and it was a pretty fun environment as OPM called off Monday's work while we sat there. Then we moved on to DC9 for another round with Sheena before climbing the snow mountains to return home. I did a spot of work work on Monday, but mostly caught up on household crap and life and went to the gym. I'm 2.5 months in to my membership there, and am pretty confident that my fellow gym patrons there are more encouraging than annoying. While many of the regulars have the bad habit of staring at others a little too blatantly, and there are a select few that are absolutely pushing their bodies too far, I still find it overall a much more supportive environment for getting and staying in shape. Later that evening while coming home from work, B suffered our only household casualty by falling on ice right outside of our building. He is currently laid up on the couch with a swollen ankle, poor thing. But the upside, if any, is that he was off work today while I went in for a few hours. I'm a typical East Coast Type A obsessive professional, but I feel more confident about my workload now. Catching the bus was a bit of an adventure as one of the aforementioned snow mountains had overtaken my bus stop. But I awkwardly stood on top of it, and confirmed it is in fact easier to see the bus coming when one is almost two feet taller than usual! I also was able to get to the grocery store and buy most of our missing grocery items. two feet of snow is cray! we never get snow days. actually i shouldn't say that, we got one during the storm we had post-chrismukkah a few weeks ago, but i was already on holidays that day. boo. It was intense. 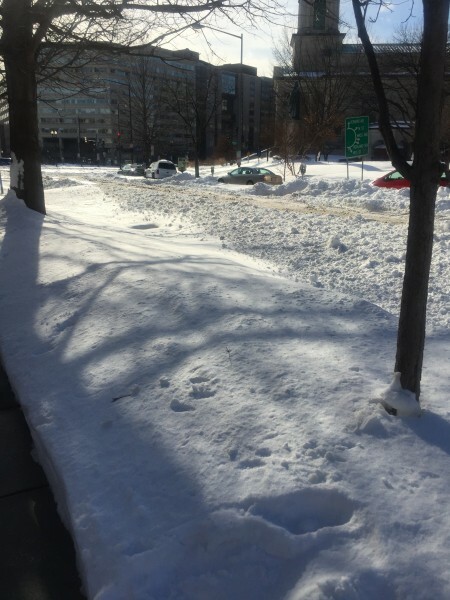 Today the feds were on a three-hour delay (needed as our transit is not fully back and there is much street plowing still underway) and will be again tomorrow! it's usually waiting for the plows that are the worst up here. well, that and the stupid drivers, but that comes with the territory; common sense always seems to go out the window when the snow starts to fall. I am chuckling since it looks like you guys got our snow. Meanwhile in Canadaland it was really warm yesterday and a lot melted off. It snowed overnight, but I only have about an inch to shovel. It certainly isn't an annual occurrence here. 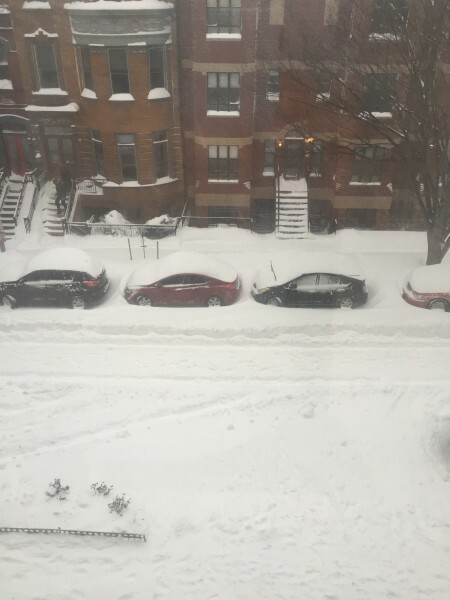 The last snowstorm approaching this size in DC was in 2010.
i chuckle when nearly anyone complains about winter. i grew up on the canadian prairies; THAT was winter.